I first met producer and composer Valgeir Sigur∂sson when the Chiara Quartet (of which I have been a member for 18 years) commissioned composer Nico Muhly to write us a new piece and curate a concert surrounding it. For the concert, which was one of the inaugural concerts of the Ecstatic Music Festival, Nico decided that he’d like to also have a new piece from his good friend and collaborator Valgeir, and so he “subcommissioned” the producer to write his first classical composition, and Valgeir wrote us a stunning string quartet. The piece was called Nebraska, inspired by the state in which our quartet has been in residence for over 12 years and by the connections Valgeir found between the landscape and remoteness of that Plains state with his own island home of Iceland. The piece was beautiful, and the quartet had made various plans to record it over the years, but none came to fruition. So, when I was planning this solo album, I thought about how interesting it would be to have that work arranged for viola with digital production. Valgeir is also an extraordinary producer, in the new definition of the word. He goes beyond recording acoustic sounds and live performances with utmost fidelity (although he certainly does that), but is also a composer using the analog and digital tools of the recording studio. 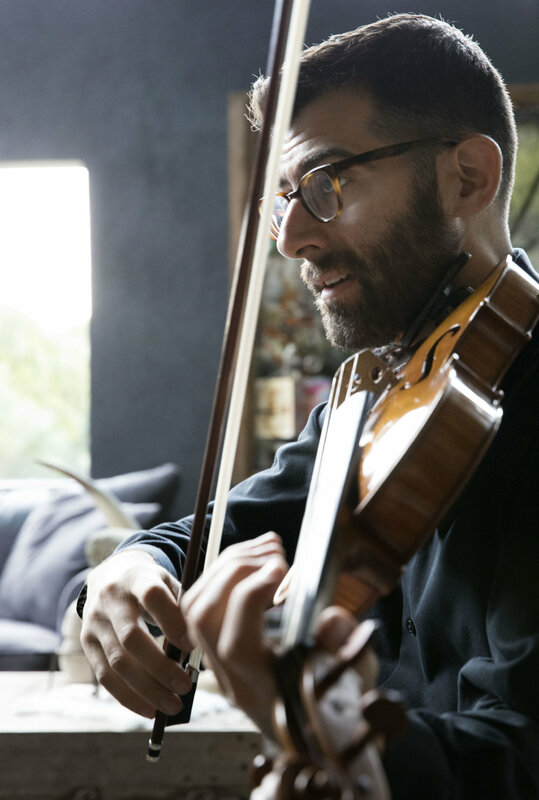 He was well-known for his work with the Icelandic pop singer Björk, and I came to know him through his work with Nico Muhly and my sister, the wonderful violist Nadia Sirota (yes, two violists in the same family. Nadia contributes a stunning performance on the album in Nico's new piece Lean, more on that in a future installment!). Valgeir produced Nadia's solo viola recordings, and did so with such a modern and amazing sense of the texture of the instrument, capturing her fierce spirit as a player with such reverence and honesty, that I knew I would want him to record me someday. I asked Valgeir to contribute the arrangement of his quartet, but he ultimately decided to start over and write me an entirely new work. The coolest think about it is how it is constructed. When I went to his studio, Greenhouse Studios in Reykjavik, he presented me with an aural “map,” a piece of music I was to improvise over. I did this maybe a dozen times, each time refining the improvisation and including various elements as he saw fit (including unusual extended techniques using the wood of the bow, or percussive drum beats on the body of the instrument itself, or cool ways to pluck the strings). Then he took all of these elements and put together a piece, but removed the original “map.” The piece is basically evidence of something no longer there. Clues without a key. It is such a cool way to write music, and I am so excited about the results. To hear the new piece (still untitled!) on the album STRONG SAD, click here to preorder for a June release.